PCD Pharma Franchise in Uttar Pradesh – Apikos Pharma is the well-reputed name in the field of pharmaceutical companies. We are WHO Certified Pharma company. We manufacture the wide range of PCD Pharma products such as soft gels, capsules, tablets and syrups, oral liquids, topical gels, the range of creams, oils, powders, lotions, sachet and effervescent etc and many others to fulfill the needs the requirements of the customers. We specialize in marketing, research, manufacturing, and development of the Pharmacy industry. We also offer the business opportunity for people of Uttar Pradesh. We are offering the PCD Pharma Franchise in Uttar Pradesh. We are the best pharma franchise company for PCD Pharma franchise business. Our franchise business model is based on monopoly rights, genuine prices, free marking tools etc. We always welcome to Pharmacy dealers, Pharma distributors, Medical Representatives from all top cities of Uttar Pradesh to become our PCD Pharma or Pharma Franchise Partner. So if you are looking for PCD Pharma Franchise in Uttar Pradesh (UP) then we are the best option for you & contact us at +91-9855087879 for more details. Apikos Pharma with sheer perseverance and wisdom in the pharmaceutical industry at various levels is headed by Mr. Harish Sharma and Mr. Anil Kapoor. Their outreaching guidance and hard work led to the set of a highly profiled name in the competitive industry of Pharmacy. Our mission and aim are to create a healthy environment which not only improves health but helps shine the lives across the world with our utmost dedication. We provide the pharma franchise on district wise basis where you can grow your business on a monopoly basis. We provide the Full Fledged Promotional support for the franchise in the shape of Visual Aids, Literatures, Sample catch covers, Small gifts etc So if you looking PCD Pharma franchise in Uttar Pradesh then must contact us. These five pillars symbolize the quality of our people and our way of working. Our objectives can take a change but our five core values have always been rigid and have always inspired us to get better with our services. hat what makes us the best PCD Pharma Company in Uttar Pradesh among the associates. We are committed to providing a high-quality range of medicines to our customers as per the industrial quality standard. Our product development, technical support, and marketing team ensure to bring evolution in every therapeutic area. We are known for our uncompromising quality standards in all our products and services. We get all the raw material supplied by a trusted vendor who is best in the market and provides hygienic products. The company provides the quality assurance team which after the quality of every product. We are known for providing the best quality at affordable prices. Among the other PCD Pharma Companies in Uttar Pradesh, our company has emerged as one of the best options for pharma franchise / PCD / monopoly Lucknow, Uttar Pradesh along with other regions. This all because of our quality medicines recommended by the health professionals. 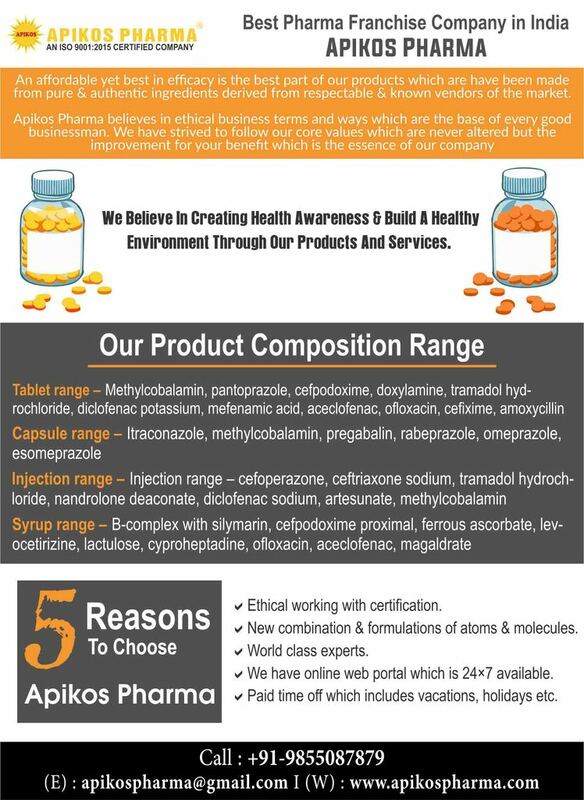 Apikos pharma is top leading pharma company that offering the high-quality products in a cost-effective way. We have modern processing unit, which is in accordance with the WHO-GMP standards. So We provide superior quality pharma products in the market. We offer marketing backup at the initial stage of the setup. We will deal with the competitive process so that you are not at any burdened side. We shall deliver the products on stipulated time, however, in the case of any problems we shall update you Safe and good packaging is provided by our company. You don’t have to worry about investments too, as our company makes an agreement with minimal investment amount. We guarantee a monopoly in the area of your state. Uttar Pradesh is a rapidly growing economy which is currently the third largest economy in India. It has good potential to become the best as it has the advantage of being rich in resources whether it is the human resource or other resources. The state being most populous can be the driving force to great profits for our partners. Great opportunity for great opportunity grabbers. This will not only open new horizons but is also a great opportunity for you to be our franchise partner and dealer. Watch you money investment grows into an empire. So Apikos Pharma is offering PCD Pharma Franchise in Uttar Pradesh. Pharmacy dealers, Pharma distributors, Medical Representatives from all top cities of Uttar Pradesh (like Lucknow, Varanasi, Agra, Allahabad, Kanpur, Jhansi, Meerut, Bareilly, Aligarh, Moradabad, Mathura, Ghaziabad, Noida, Fatehpur, Faizabad, Gorakhpur, Saharanpur, Ayodhya etc )to become our PCD Pharma Partner. We are offering PCD Pharma franchise in Uttar Pradesh. We welcome experienced, qualified and genuine individuals, corporate, monopoly rights and PCD Franchises etc in Uttar Pradesh to become our associates from all over India. With years of experience in the pharmaceutical sector. Our brand has gained the trust of healthcare professionals and experts from all over the country. Our Company has good reach among the doctors and provide everyone with good growth opportunity. This PCD Pharmacy Company is ISO 9001:2015 certified Punjab-based company. All our products are approved by the Drug Controller General of India (DCGI). We have the latest molecules for your better success. We ensure longtime cordial and transparent dealings. We value you every effort. So, if you achieve your targets, we award you handsome incentives. The company provides its associates (Franchise) with the Product manual, Product information updates regularly. We are ethical and professionals in every term. Thus, we are responsible and honest in terms of transactions. We provide timely services for your easy functioning and provide medical updates and ADI.